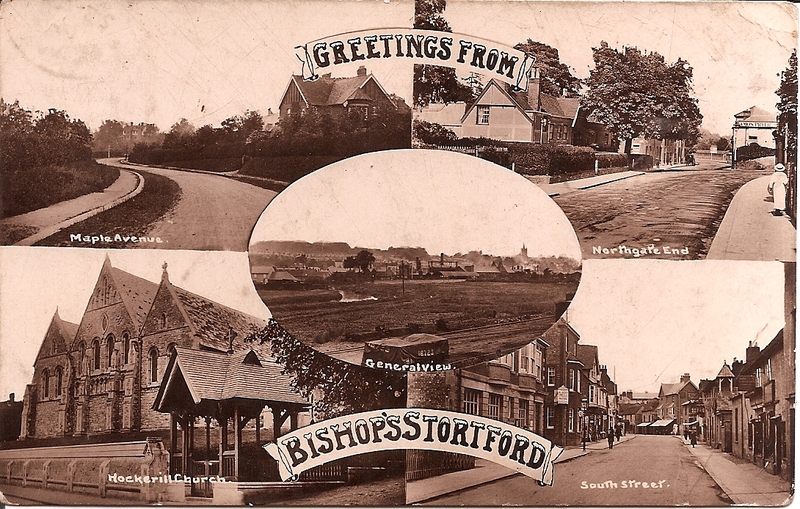 25th Nov. 1914: Bishop’s Stortford: Flanking Attack against the Leicesters. SYDNEY HIBBETT: 20 in 1914. 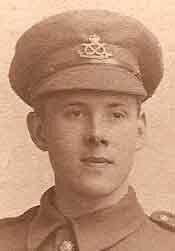 Pte SYDNEY HIBBETT 8830, 1/5th South Staffordshire Rgt. to Master BASIL HIBBETT at 95, Foden Road, Walsall. Bishop’s Stortford. 25/ Nov. 1914. What do you think of these views? We went towards London today & had a sham attack – 10 miles (1). Perfect day – cloudless sky all week – did 14 miles yesterday on a flanking attack (2) against the Leicesters – wore white bands around our hats. Hear we are going back to Luton early next week to train up the officers – have to march it I’m afraid (3). So I will fall out as it will be rotten dull. Wish I was in some other Regiment, Foreign Services I don’t think. Sydney is not exactly joking about their ‘training up the officers’, so great was the number of Volunteers. (1) Sham Attack. A military procedure to deceive the enemy. (2) Flanking Attack: ‘a flanking manoeuvre on the sides of an opposing force…’ to reduce its ability to defend itself. The intention is ‘to create confusion and threat from multiple directions’ and thereby lower enemy morale. (See Wikipedia & Google Images). (3) A 30 mile march, 9 -10 hours. NEXT POST: 8th Dec. 1914: Bishop’s Stortford: Corn Exchange & Army Orders. From Our Own Correspondent: IKY BOULTON with 1/5th S. STAFFS in LUTON to the Editor, WALSALL OBSERVER. Published 14th Nov. 1914. Still at Luton! 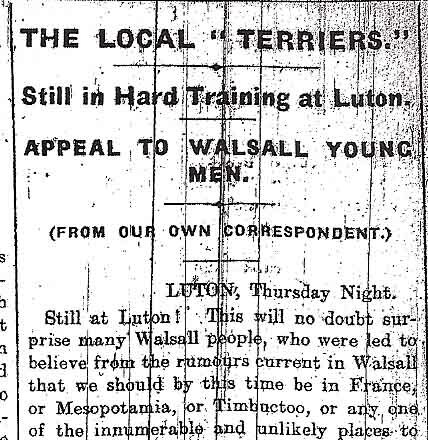 This will no doubt surprise many Walsall people who were led to believe from the rumours current in Walsall that we should by this time be in France or Mesopotamia, or Timbuctoo, or any other of the innumerable and unlikely places to which the said rumour was to send us. As I have indicated several times in my previous articles these rumours are mostly purely bunkum. No one knows quite where they come from. Like ‘Topsy in Uncle Tom’s Cabin’ “I ‘spect they growed”. I am sorry to labour this point, but because a short time ago we had orders to be READY to move at two hours notice, the unwise spent at least half a day’s pay in telegrams, and, I am afraid, caused much unnecessary fluttering in maternal breasts. Therefore I ask all readers of the “Observer” to treat such rumours as to our movements with suspicion. I did not say the 5th South will never leave Luton. It is certain, so much as anything can be certain in these times, that before many weeks are past we shall, as part of the North Midlands Division, be taking part in the fight against the modern Hun. The Training we are undergoing now is Training, which surely no Territorials have ever before been through. On Monday part of the Battalion was at the butts between three and four miles from billets. There are sixty targets on each of the two ranges. Those who were not firing or marking (I will say nothing of marking as if I wrote my impressions, I am sure that neither the Censor nor the Editor would pass them) did a little diversion of 20 odd miles. Three months ago the same marching order would have caused more fatigue in marching from The Bridge to the Station (1) than it did on Monday. Such is Training. Many are the jokes heard as to how we should miss our pack when the War has rolled away. One of my brilliant brained friends swears he will carry a typewriter for a time for fear he should be rising like an airship when the weight of the full kit no longer keeps him down. In this regard fancies differ. Personally, I am undecided between a linotype and a rotary on which this paper is printed. Still the effect of the Training is clearly seen in the unconcerned manner in which we carry our by no means light burden. Tomorrow we shall have another little joint, about as far as Lichfield and back (2). Some of you men “waiting to be fetched”, as the boys in khaki so pithily put it, try and walk half way, say to Brownhills and back (3), and then you might perhaps realise that it is not only musketry that makes the effective soldier. It is no use waiting until things are at their blackest. “The old country will win through all right” I can hear you saying. We have no doubt of that. But what are you doing? Some of you of course are engaged on military contracts. These cannot and must not come. But are there not others? You of military age, physically, fit who have not joined ought to hear some of the comments when the men return here from leave. “I met so and so in Park Street yesterday still in civvies”. “I thought he had more pluck”. This is a typical remark. There is a widespread idea that the War will not last long. Perhaps it will not. But why not trust the greatest military expert of the day and when Lord Kitchener asks for recruits why not answer his call? Your King and Country needs you. Bridge Street, Walsall 4th Sept 1914. Pte ISAAC (Iky/ Ikee) BOULTON, 8831, ‘A’ Coy, 1/5th S.Staffs, enlisted between Pte Sydney Hibbett, 8830 and Pte Bertie Hibbett, 8832 on 4th September, 1914. Regimental Records: (T to E) Transferred to England, ( injured?)18.5.1915. Further Information Unconfirmed: 1911 Census: Isaac Boulton,18 yrs, nephew of Rachel Dakes (widow), born Smallthorne, Staffordshire. Pupil Teacher with Walsall County Council. England & Wales Deaths: Isaac A. Boulton. 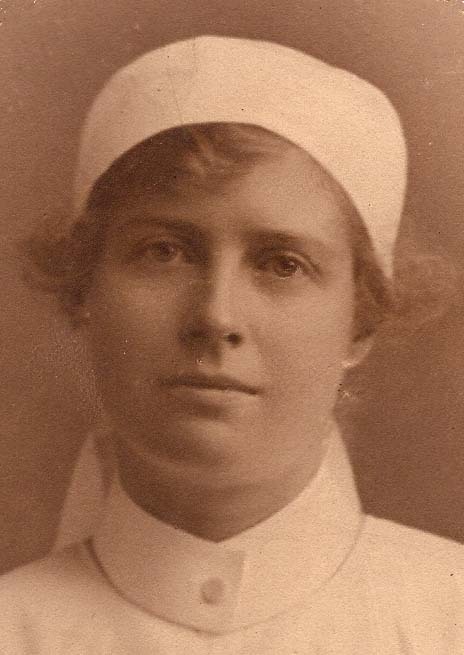 Age 24, Jan- March,1918, Walsall. Parents possibly Joseph H. Boulton (Beer Retailer, 5, Rolling Mill St. Walsall) and Elizabeth Agnes Boulton. Questions: QMS Old Boy? Did he die of his injuries? No CWWG entry. 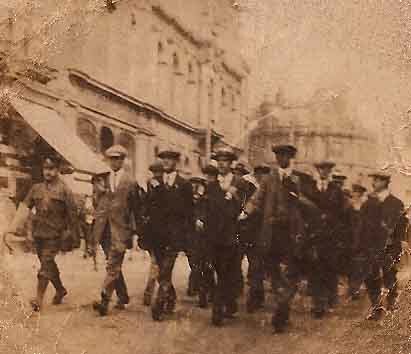 (1) Volunteer’s March to Station: 4th Sept. 1914 – less than a quarter-mile. (2) Walsall to Lichfield & back-18 miles approx. (3) Brownhills: village 6 miles from Walsall, edge of Cannock Chase (where Staffordshire Hoard discovered in 2009) – i.e. a March of 12 miles. NB: Walsall Observer 14th Nov. also reported on election of J.N.Cotterell as Mayor cf Letter 9th Nov.
NEXT POST: 25th Nov. 1914: PC to Basil from Sydney. Pte BERTIE HIBBETT to his Sister IDA at 95, Foden Road, Walsall. Still in Luton Nov.11/ 14 (1) Thursday night. I was going to send you a P.C. but there are one or two interesting things to tell you. First and foremost, Syd & I thank you to the utmost for the cake – the trouble you went through, both in making it, looking after it in the oven and the anxiety as to whether it shall taste all right. As a matter of fact you will, or at least I hope you will be quite satisfied and happy to hear that the cake was simply topping. I shared some with Vernon Evans who said he liked it. Of course who could dislike such a home-made cake, full of all that’s good. It tasted juicy and fresh & all the better for its plump in the middle, & it arrived all safe and sound. A welcome parcel indeed. So glad our parcels were opened by the fireside as, I have an idea now, that I hoped they would be. I saw one of those hunting parties I have rarely seen in my life – I don’t think since the Uffington days(2). The pack followed the Battalion & tried to overtake us in the town, but our long train prevented them. The huntsmen were dressed in red and rode the old grey horse of Pickwickian days. Your letter was most amusing to read & I commend you upon your fluent Irishism! Thanks extremely for the little huswife (3) which poked itself from an unseen hand through the letter box & dropped with a pleasant thud on the floor; a useful little waterproof article indeed. Tell Mother I forgot to enclose ‘India at War’ in my last parcel but I sent it on to the great literary enthusiast H.V. Hibbett Esq. of Wolverhampton. He, I trust, will let Mother read it this weekend. Is not it really splendid the way the Indians are helping us! Capt. Lister, on reading the not altogether good news this morning, said we ought to send more of our men to the Front. It is very uncertain now that we shall remove from Luton this side Christmas, but nothing can be taken for granted. Such a lot of recruits joined lately – therefore inefficient. How’s Dodger(4) getting on? Just a line from him would be welcome & some more of his problems in trigonometry. I should give worlds if he could solve when we go off on Active Service. Did Mother go to the Mayoress’s Luncheon? 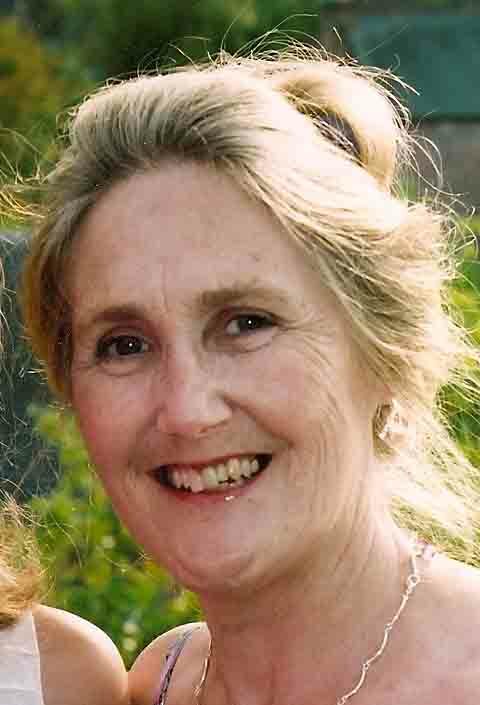 (5) & have a chat with Mrs. Evans, who had to leave Luton this Monday morning because of the occasion. Is it worth it? I daresay many of us have asked ourselves on the quiet. I say after all Yes, but our spirits are all ups and downs – (see back of this (envelope)). singing for some time but on nearing the town we picked up ‘It’s a long, long way to Tipperary. But we’re not downhearted’ – Yet. In the rhythmical swing of the old, old tune. I often imagine you all taking it in turns reading sheet after sheet of Sid’s long letter. Basil, perhaps in the train on return home, looking forward to a letter. All good wishes & best love to all from your ever affec. brothers – Sid & Bert. NB. I hope you’ll find the album all right for photos. I chose it because I thought it will hold any sized photo & it has no fancy stuff about it. Aren’t Sid’s ties lovely, but don’t get so over bubbling with joy. What oh! ”Is it worth it?’ As Bertie’s Letters continue it is noticeable that he confides his fears and uncertainties to his sister more than to anyone. NEXT POST: 12th Nov. 1914: Pte Iky Boulton 1/5th S. Staffs sends his copy on ‘The Terriers’ to the Walsall Observer. 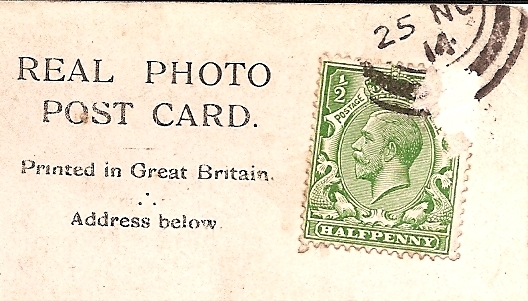 Many thanks for the Postal Order. I got two tins of Borace Powder specially made with holes in a revolving lid (1). My feet have got much better since last Home Leave, but just after this 21 mile march they have got a bit sore again. I guess Syd has told you all the news, but I don’t think he has mentioned that the late Mr. Hoyle the late Inspector of Schools in Luton, died about May of this year (2). The people here say he was a Yorkshireman & the present Inspector is a Mr. Carter, but they don’t know where he has come from. I won’t forget to send a newspaper to York (3) when I go abroad. What’s the idea? I will not say much more for I am very much afraid of repeating Syd’s news, so I’ll shut up. I will just say one more thing & that is please give Mother the pamphlet “India at War” (4) for I know she is greatly interested about the attitude of India. I have bought several of these little instructive pamphlets which I am sending to Harold who is another literary enthusiast! Best love from your affectionate son, Bertie. Next Post:11th Nov. 1914: ‘Still in Luton’ (3). Bertie to his sister Ida. Pte BERTIE HIBBETT to his youngest brother 16 yr old Basil at 95, Foden Road, Walsall. How are things? When does the exam (1) come off? I hope you’ll pass successfully. I daresay by now you know how we spend Sundays. We don’t know what will happen or where we shall go or what time we shall parade. One Sunday you heard that we went to the Railway Goods Stores. A week last Sunday I was on guard. Yesterday Sunday 8th I was dismissed with Sid and others because we were too many (2). We go to Church indoors now, weather being unfit for outdoor services. So Sid and I went to Caddington (3) – so pleasant & the sunshine in the Church made it look bright and cheerful. The Sunday before, the Parade went to the Church in the morning & you remember reading my letter to Mother mentioning the hymns. Well isn’t it a coincidence that on the day we sang ‘Eternal Father’ the ‘Good Hope’(4) (cruiser) went down. I should certainly think that if we knew that such a catastrophe was occurring we should have sung that sea hymn with much more earnestness & vigour. On the Saturday before, we practised retiring & were told that on no account must we double on retiring, but retire on quick march. Capt. Lister (5) said he would shoot the first man who began to double at the front. Ha! Ha! On the march we caught sight of a roadside advert for Continental Tyres. Stuck on the plate was a huge strip of paper with ‘MADE IN GERMANY’ all the way across. How we laughed! further on we saw Dunlop Tyres with the Union Jack printed on it. Today we got up at about 5. 00. Should have got up at 4.30, but the knockers-up overslept themselves I should think. We went to the Range, but after having breakfast there Syd, myself & some others were told off, there being too many markers & we were ordered to join the Route March which would shortly pass the butts. Eventually we did and my word, tramp, tramp, tramp, we did nothing but tramp & rest & have dinner and the same the way back, but with fewer rests. We covered about 21 miles not less & we again saw the ‘MADE IN GERMANY’ posted on Continental Tyres. No smoking cigarettes, no buying off hawkers, no drinking allowed on marches in future. The Cadbury chocolate trade is therefore badly going down & it does look feeble now. Up comes the Colonel or other officer if you disobey the above orders. Arthur Brown (6) stayed at the butts to act as a marker for the firers. We saw him alone at the Range on our return; he marched with us some of the way. 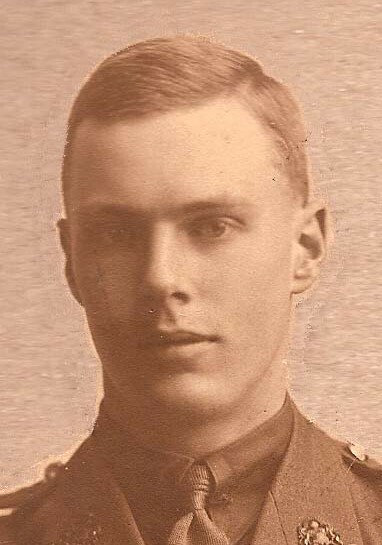 Being a marker he needed no rifle & had got his great-coat on – up comes Elwell, the Aide Camp (7) – wants to know why he is marching with us and who’s rifle he was carrying (Arthur had offered to carry a rifle of a tired comrade). Brown replied he had come from the Range, and at that Elwell kicked up a shindy with the private who had given up his rifle to Brown – and Elwell told Brown to clear out of the ranks & go behind or walk on the path. So Arthur Brown chatted with Syd, who marched just behind me. On Sunday we were given little Active Service Prayer Pamphlets (9) and a bag called an Emergency Ration Bag (10), used only on Active Service when in most urgent need (i.e. hungered to death) then & only then are we allowed to use them. We have been doled out with little mugs too, to be used on Active Service. One Pte comicly (sic) remarked that it was to dip in the muddy river, and we were to get to be practised to squirt the sludge that lay on the top from between our teeth & be able to drink the water underneath! Tell Ida that Sid and I had a pleasant little chat with Fowler Black (11) . You remember him don’t you? Ha Ha – he did not join the O.T.C. as he wished but is in the 6th South Staffs. He only joined the colours a fortnight ago; he’s got no kit or hat badge, but managed to put on a new tunic. Taff Davies’ brother (12) has had Government orders to make tunics at 3/- each & less I believe; that’s what Mrs.Evans(13) told me, losing 3d on each one. Well Good Luck & best love to all. Bertie. MY MEMORIES OF THE FIRST WORLD WAR: I remember writing to my mother that I was in the service, not of George V, but of the King of Kings. 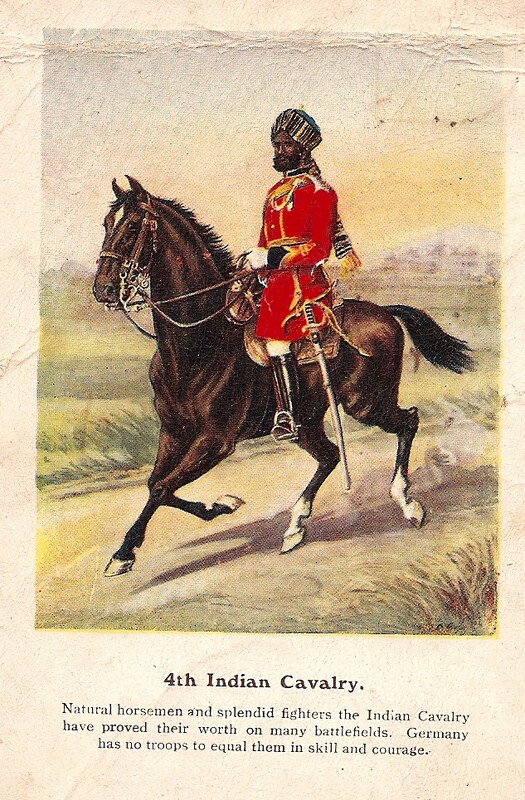 I had been brought up a confirmed Christian, and gave my name to the recruiting officer as C. of E. My faith was certainly tested when we were first billeted in Luton. I had to sleep on the floor with other soldiers and when I attempted to kneel to say my prayers a boot came flying over towards me. It was the first time in my life that I had experienced what might be termed persecution for one’s Christian way of life. I was 19 years old. The Revd. Arthur Hubert Hibbett. 1967. The Correspondent was most probably IKY (Ikee) BOULTON, whom Bertie called ‘the Observer Man who puts all our doings in the Walsall papers’; one of his pals on Listening Post 1915. He writes about the very training described by Bertie in his letter to Basil on the Monday before – and finishes with an appeal for more volunteers from Walsall. Full Transcript to be posted on 12th Nov. 2014. (9) Active Service Prayer Pamphlet. 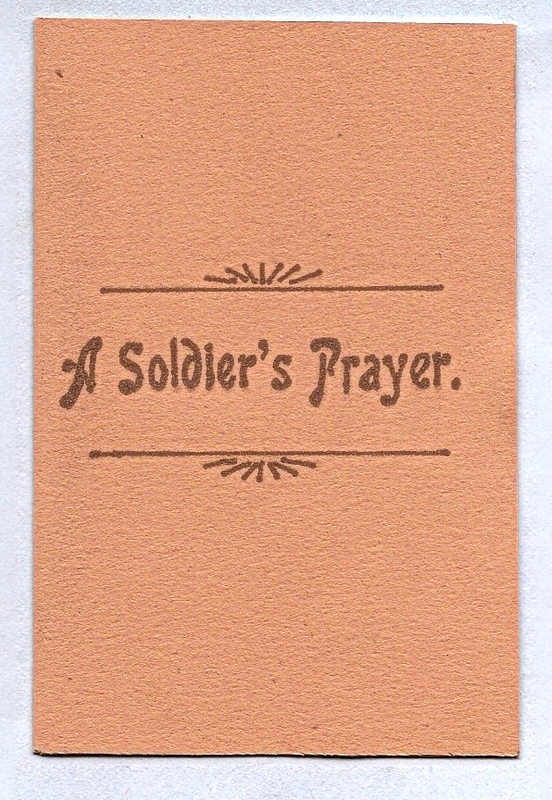 Bertie’s copy is lost, so also is his tiny Prayer Card, issued by the Chaplain General in Aug.1914 to ‘slip inside your cap’. The Pamphlet contains a wide selection of Christian Prayers for Morning & Evening and ‘In the Hour of Need’; and ends with Into Thy hands I commend my Spirit. Copies obtainable from http://www.tommyspack fillers.com. Tea, Sugar, and Salt were packed in a Tin which was open at one end. (11) Fowler Black: born 1895 in Walsall, middle name ‘Middleton’. Same age as Bertie. Old QMS Boy? (12) ‘Taff Davies’s brother’ – could be same family as Mr W. Davies, Athletic Outfitter and Leather Goods Dealer, 22 and 23 Walsall Arcade, well-established in 1914. (13) Mrs E. Evans, mother of Vernon (Bertie’s best pal), wife of future Lord Mayor of Walsall, Enoch Evans, Solicitor. 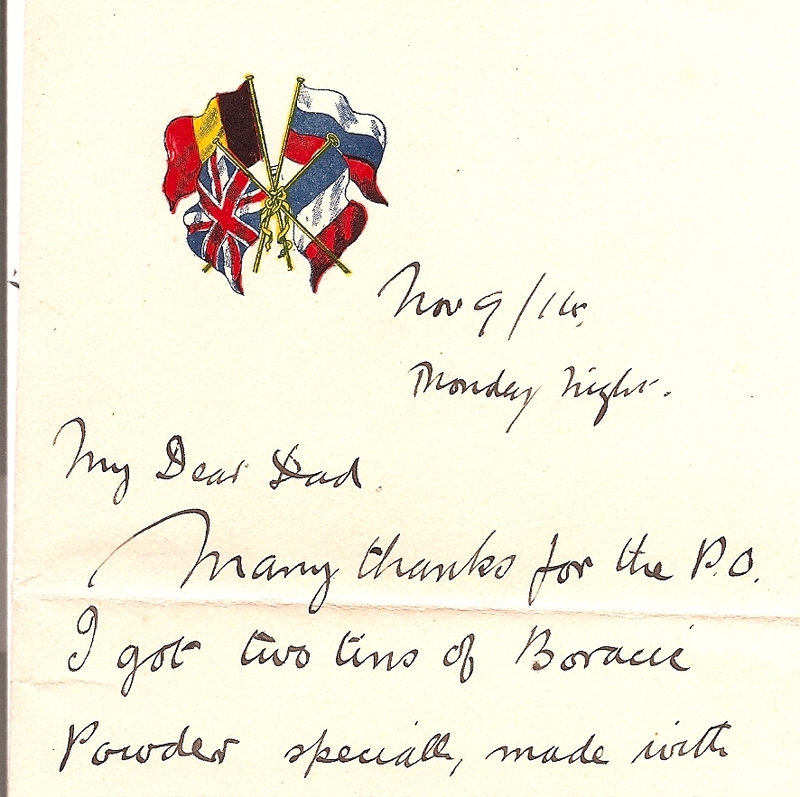 Second Post 9th Nov. 1914: To Pater. Still in Luton. (2).